It is understood that many women in prison come from a background of disadvantage. Indeed, it is reported that as many as 80% have a mental health diagnosis of varying severity. Predictably, many women have been looked after as children have suffered violent relationships and childhood abuse. As many as 70% of women in prison are thought to be substance abusers. Roughly 600 women a year are thought to be pregnant in prison in the UK although precise figures are not kept. 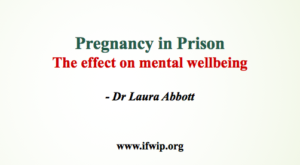 There has been very little research which looks specifically at women’s experiences of pregnancy in prison and my doctoral study set out to understand how women experience pregnancy and becoming a mother in prison. My research took place in 2015 and 2016 and I spent time observing 3 English prisons and interviewed 28 women and 10 members of staff. My research has exposed how perinatal women experience that environment and the potential impact upon her. I found that women experienced frustration and stress which impacted upon their emotional wellbeing. Being unable to access basic comforts, support, acceptable nutrition, and fresh air was commonly expressed by women. Some women wanted to hide their pregnancies by wearing baggy clothes – whilst the threat of violence was often perception rather than reality, women were often frightened about the possible threat to their unborn. The fear of potential separation from their baby was an underlying stress for many women. 50% of women are separated from their newborn babies soon after birth, yet during pregnancy, the ‘not knowing’ whether she could keep her baby caused complex emotions. Women found it difficult to know whether bond or to emotionally ‘let go’ of their unborn. Stress was expressed by most women in my study: ‘your minds just ticking over all the time’. Concern as to the effects on the unborn of the physical effects that stress had on women was commonly described. Women were very aware that they should not be ‘stressing out’ yet felt intimidated by the environment and other inmates leaving with them often with a constant sensation of alarm. Worry was often dealt with internally, usually when a woman was alone at night, unable to sleep. The feelings of stress and suppression of emotions meant that women would feel sensations of fear and panic. Confusion, disempowerment coupled with immense concern about their unborn baby were common experiences for women, especially when incarceration was in the third trimester of pregnancy. With limited autonomy or choice, the pregnant woman’s emotions are submerged with frustration. Her identity is hidden, wanting to ‘forget’ she is pregnant or trying to ‘ignore’ her pregnancy. Suppression of emotions causes strain on the woman as she tries to act like a ‘normal prisoner’, often ‘hiding’ her abdomen under baggy clothes. Staff too are left vulnerable to the emotional trauma of separation of a baby from his/her mother with staff attending labour and birth, often having no route to debriefing or specific training. Research is conclusive that toxic stress can impact upon the unborn baby and that child’s future life and whilst my research did not follow up the children – it can be suggested that the babies, already disadvantaged face the effects of the prison environment well into their childhood through toxic stress experienced whilst in-utero. Of the 28 women interviewed, many described how they ‘blocked out’ emotions – suppressing their feelings and not allowing any weaknesses to show. Being in a permanent state of anxiety, often with pre-existing mental health issues, away from support networks means that pregnant women in prison are at high risk of developing or exacerbating mental ill-health.